With a grain of his own unique contrariness, he readily emphasizes that in case of Category 5 hurricane, he would remain sitting in his living room, eating peanuts and contemplating nature’s frenzy. 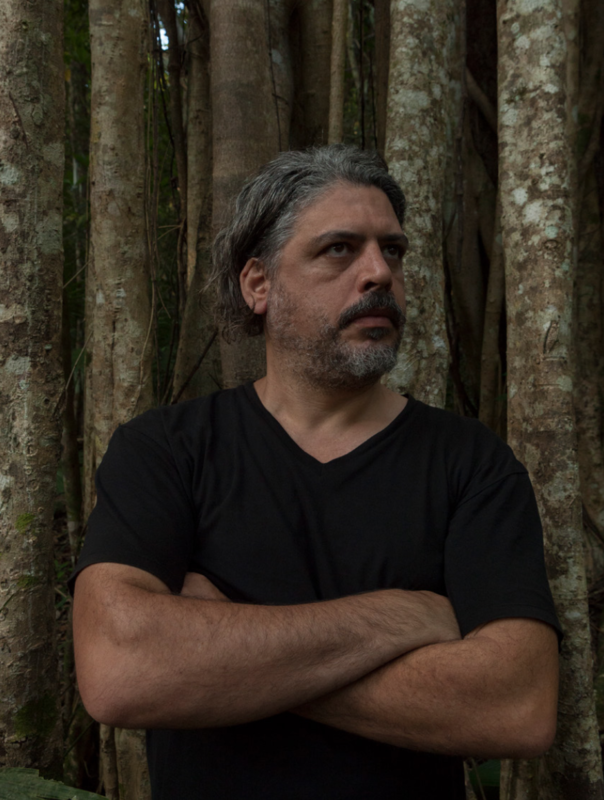 Meet Rodrigo Larios, architect, artist and master in living. Rodrigo Larios, my ex-brother-in-law is a genuine beast, as much in metaphorical as in quasi-literal sense. This impulsive, radical, endowed with athletic physique and fiery looks, alpha specimen has been living in Mexican selva for years, realizing his architectural fantasies. Curious constructions he creates resemble nests of giant insects. As every ‘mad’ architect, Larios operates scale with no particular restraint: living room in his own house could easily host Megatherium within its confines. However, and simultaneously, due to its peculiar nature it is extremely human-friendly space. Chunks of matter fluidly transforming into each other, interiors where floors are the only planes, absolute lack of angles and borders, exaggeration with simplicity kept intact – the whole thing is both relaxing and stimulating positive thoughts. I’ve decided to propose USTA (LIPS) to write this material not only due to the fact he is someone I truly admire – my pantheon of still-alive heroes is rather extensive – but because he’s the only radical visionary whose creative path I was practically able to keep track of throughout his whole adult life. At the same time, it seems to me that Rodrigo’s output should resonate well in this space: he mostly employs natural materials, while his activities are motivated by a notion of self-reliance. All of his realization originated independently, without organizational support and subsidies. He uses and combines folk and ancestral construction techniques in a completely postmodern way, without being a slave of tradition or regionalism. Larios creations remain at peace with whole nature surrounding them. In spite of his free-wheeling manner of tapping on the experiences of Flower Children generation and their New Age followers, what he does and how he lives cannot be contained within any post-hippie formula. Larios is altogether devoid of esotericised naïveté so typical of the devotees of similar world-views: while fantasizing, he simultaneously keeps his feet on the ground. First-generation Mexican, child of Spanish intellectuals which came to the New World at the end of the 1960s. Born in 1976 as penultimate of the five siblings, he grew up in Satélite, relatively tame Mexico City suburbia inhabited by middle-income middle class. However, it was not quite typical childhood insofar as both of his parents were highly devoted to the written word, which is not at all obvious in Mexico and does not necessarily go hand in hand with one’s social position. His father Pedro Larios was charismatic and unruly figure. I think that Rodrigo owes his radicalism and healthy dose of self-confidence which accompany him as long as I can remember, to permanent confrontation with this remarkably strong personality. As he recalls, they had smallish cheap TV set back home, so when the whole pack sat in front of it, he as a kiddie of the family was not able to see a lot above his brothers’ arms. So, he preferred to draw. Later, mother brought him from the publishing house where she worked, a mammoth white brick, block of sewn-together pages which served as the mock-up of someone’s book. He meticulously began to fill it with his pictures, page by page. Already as a teenager, he was quite aware that art was something he wanted to deal with in his life. At home, he unceasingly stumbled onto the masterpieces of the most important 20th century Spanish painters, like Pablo Picasso, Joan Miró or Antoni Tàpies, but also old European masters such as Albrecht Dürer and Hieronymus Bosch. He wanted to become a painter. He started studying architecture without much enthusiasm, mostly in order to pacify his parents, to give them conviction he would have s stable profession and that he would not ‘starve himself to death’. What seems obvious, during his study Hundertwasser, Gaudi and Mexican Javier Senosiain were the ones he felt most affinity with. However, deep in his heart, he was not really propelled to start working at the construction site. Thus, he decided to do a degree and continue with painting. As fate would have it, immediately after his studies he came close to another extremely charismatic personality, Memo Siliceo. As it turns out, animal magnetism is after all factual: contrary to principles of physics, bodies endowed with consciousness attract one another, if only they are equipped with similar potentials. Memo is a figure that evades any cliche so much that he could easily become a topic of a sizeable monograph himself. What’s important for my story, since 1968 he has been developing self-built, and already somewhat legendary today, Casa del Árbol. It is a peculiar enclave located in Desierto de los Leones area on northern hillsides of Valle de México. It consists of a series of fanciful wooden houses surrounded by inter-connected gardens. At every step, one encounters such architectural elements as round windows, furcate balustrades and spiral staircases, with no shortage of little towers and ponds. Genuine Hobbiton, in which architecture creates one-of-a-kind combination with tropical and mountain vegetation, where cherry trees bloom in the shadow of arborescent cacti, while each house looks like Křemílek and Vochomůrka, dwarves of 1970s kids’ Czechoslovakian animated series, might come out of it at any time. Since the very beginning of its existence, this special kind of asylum has been associated with an adequate life style, not always conforming to obligatory rules, saturated with the spirit of rebellion against stiffly formatted reality and ever-present belief in the possibility of being one’s own destiny-maker. Larios first came to Casa del Árbol by streak of luck (one of his friends rented house there), and almost instantly, he became aware he would like to stay in this place for longer. Initially, Siliceo gave him a dusty answer, but Rodrigo does not belong to people who give up easily, so he was finally proposed to convert old stable to a house. All those funds invested in the construction were to be deducted from the costs of renting. Rodrigo sold his slightly bumped car, and he fiercely got down to work. In the same period, he initiated his own experiments with alternative technologies. He started with erecting walls made of bales of straw, covered with adobe – a mixture of clay and straw – on the outside. At that time, we got to know each other for good. Even today I can remember his stare, when I commented upon his construction decision as ‘romantic’. Time has shown how much I was wrong, perceiving him then as a starry-eyed idealist. Rodrigo started working under Memo’s inspection, first as an apprentice, to turn quickly into a full-scale collaborator and master’s right hand guy. He always stresses how much he owes to him, but this is not about technological know-how or aesthetic solutions, as in this matter Larios, without disowning Siliceo’s influence, consistently treads his own ground since the very beginning. To far greater extent, it concerns certain philosophy of life, ability of working with people and managing means, that warped élan vital which is constantly at a boiling point within both of them. My intention is that the reader should understand that I’m trying to come up with a tale that’s not about architect, creator and artist, but a master in living. Both in Rodrigo’s and Memo’s cases it is altogether impossible to separate life from work. In the years 2001-2009, functional solutions proposed by Larios helped to improve many constructions arising in Casa del Árbol. What he perceives as symbolic breakthrough moment of his life was setting sculpted gate leading to a property in motion. They remained dead shut since this enclave came into being, with Siliceo constantly repeating he would move out as soon as they get opened. In 2005, Rodrigo equipped them with an axis and a set of counterbalances, and less than half a year later they both moved with their families to Quintana Roo in order to take up preliminary work on the project which Siliceo initiated in selva near Playa de Carmen. Two centers that are still in their growth phase, Na-Ha and bigger Sacbe, were set up there. Up until now, around thirty dwellings were created in their area. 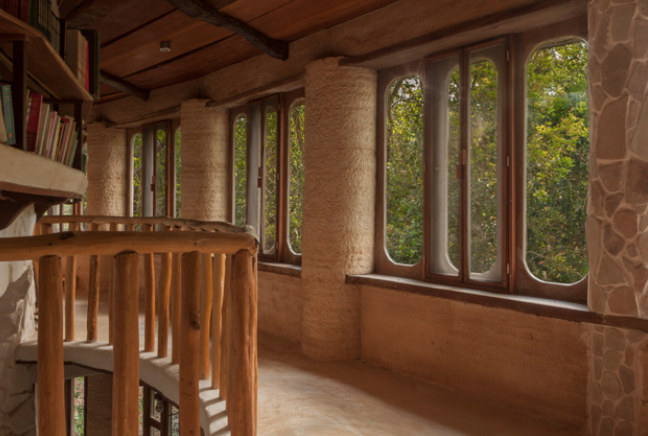 Rodrigo has worked in parallel both on designs and several construction sites, investing every earned penny in building of his own house which he treated both as laboratory and showroom. He received building site in Sacbe as part of the remuneration for his work. In that time, he also began to promote his concept of bio-architecture and worked on numerous projects located both in peninsula’s interior and on its coast, always making realizations of unique character which employed his favourite unconventional and unacknowledged technologies. Fascination with the problem of self-reliance that borders on obsession brought many interesting results. In contrast to the weather conditions proper to Desierto de los Leones, where it can be truly cold during Mexican winter based on its location (nearly 2500 metres above sea level) and where, due to the fact cited above, wood is the basic construction material, in stuffy tropical heat of Quintana Roo Rodrigo began to employ stone, prone to naturally ‘holding’ coolness. In his home there is no air-conditioning installed, it is replaced by a regulated circulation of air (artificially generated draughts, high ceilings) and a system of drainpipes-canals surrounding dome-like roofs and grooved unto them, with spring water pumped by means of solar battery powered machinery flowing through the drainpipes. Two water curtains are situated on the roof. I have to admit that one of the more pleasant experiences I know is standing in full sun and watching upper branches of the trees from bird’s perspective, while streams of icy water massage your neck and back. In the near future, Rodrigo plans to construct two skyward bathtubs-ponds on the roof that would cool you down on sizzling-hot days, without straying too far from home. In the neighbouring house, also designed and realized in its entirety by Rodrigo, we can find basin with non-chlorinated water inserted into a giant wooden deck. It is powered by a well dug nearby, with water being replaced on a once-a-week basis. Larios thinks not only in macroscale, but also in microscale, devoting much of his attention to details. 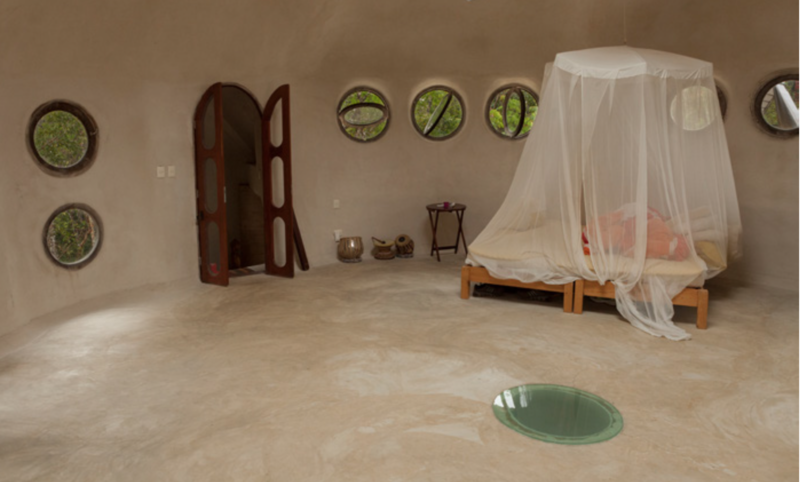 One of my personal faves are round, mounted centrally on hinges, rotary windows that are quipped with dome-like mosquito nets. Inside, they resemble spherical astrolabes, while from the outside they look like eyes of a monstrous dragonfly. 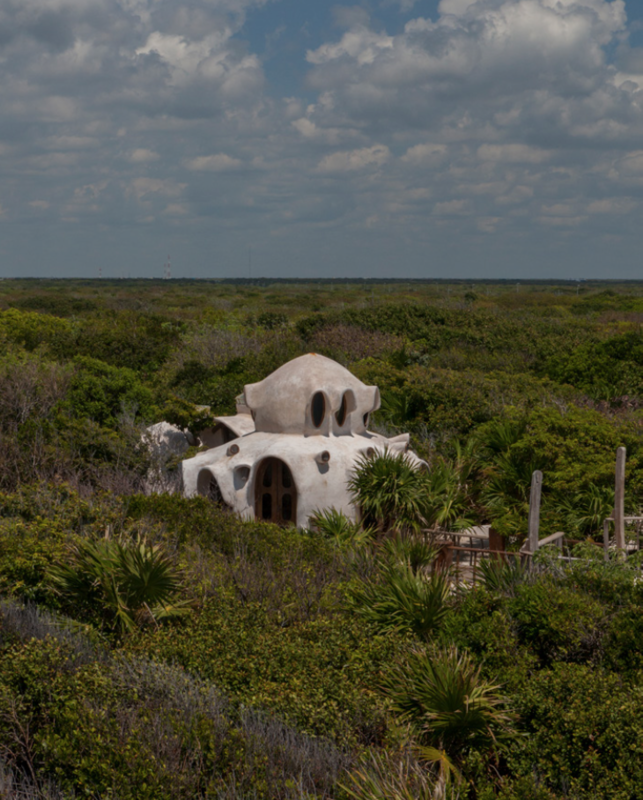 As a water-proof material used for isolating roofs and bathroom walls, he most eagerly uses chucum, a kind of Yucatan tradition, which is a mass obtained through long-lasting boiling of the bark of a tree bearing the same name. Sometimes he mixes it with Moroccan tadelakt, which has similar properties and is similarly obtained on the basis of wholly natural ingredients. Effects are nothing short of electrifying. Personal bathroom of his 12-year daughter is a true water sanctuary. One can get the impression that it has been made by a giant nautilus or other cephalopodic master of shell-weaving. His personal projects and engaments are not restricted to Sacbe. 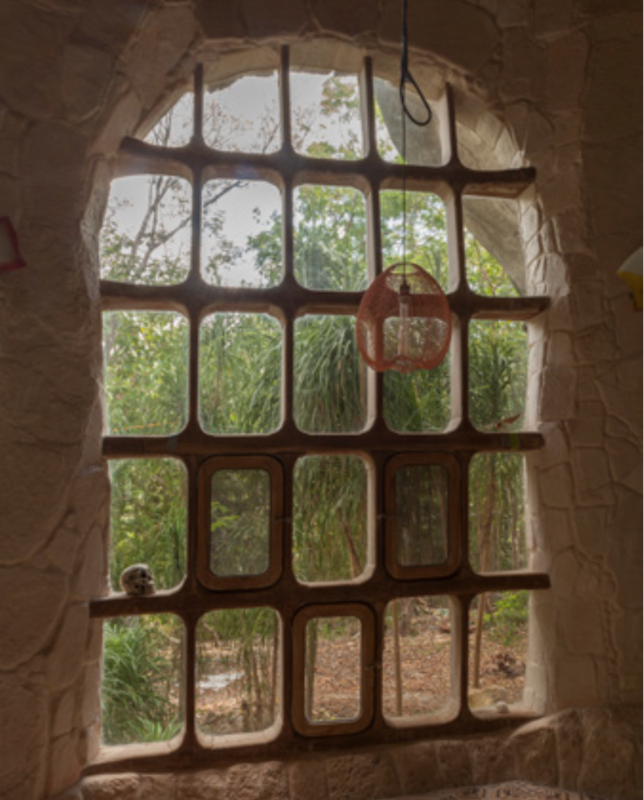 At the time of writing, he is also co-owner of the land where two magnificent cenotes are located, Agua Clara and Cantarranas. Cenote Cantarranas boasts truly respectable dimensions, with its shape close to a circle of nearly 60 metres in diameter. It is surrounded by steep rocky walls with vegetation dribbling through: vines with carneous arrowlike leaves and darker splayed garrars, tree and shrub roots (some are twisted into braid-like shapes) fall at least seven metres down like fat lianas, only to explode under surface with a myriad of miniature shoots, greedily lapping up water. When you dive into it, its colour turns to azure. It is impossible to see the bottom: Cantarranas is almost 30 metres deep and most probably, like majority of cenotes, it is connected via some crevice with a system of underground caves. In water’s vicinity, trees are considerably higher and mightier than in other parts of selva. Their branches are overgrown with tufts of silver-green tentacles, while in places where boughs branch off, red blooming bromelias are nested, orchid-like. When I was visiting this ‘oasis’ for the first time, in order to reach water we had to move while holding to a rope, and later to descend down the primitive ladder attached to a rock. Now, the way down is formed by a massive wooden staircase that ends with a wide platform. At more than three metres above the water mirror, one of the shaky beams turns into a real trampoline, but kids tend to love to jump from the uppermost steps anyway. On the water, star-shaped platform designed by one of Rodrigo’s friends, Hari, is drifting: a sort of a ferry enslaved by a rope pulled through across the cenote. It is not only another base for jumping, a mobile centre of water games, but also a site for cosmic contemplation. By contrast, Agua Clara is a kind of rocky bubble, with two round apertures in its vault, which creates fair-sized grotto that could hold a sizable congregation provided that they worshipped Neptune or other fishlike idol, as it is flooded with water in its entirety. It could also demand deeper acceptance for all creatures, including those membraneous-winged ones, because cave is inhabited by bats that live on globular fruit overgrowing nearby trees. Another staircase is leading to the surface of the water, enabling free usage of all the kindnesses of this underground swimming pool. At the moment, Larios and his associates plan to further develop these areas. Their substantial portion is to be left in its natural wild condition, with small piece being occupied by lots where private houses would be erected. 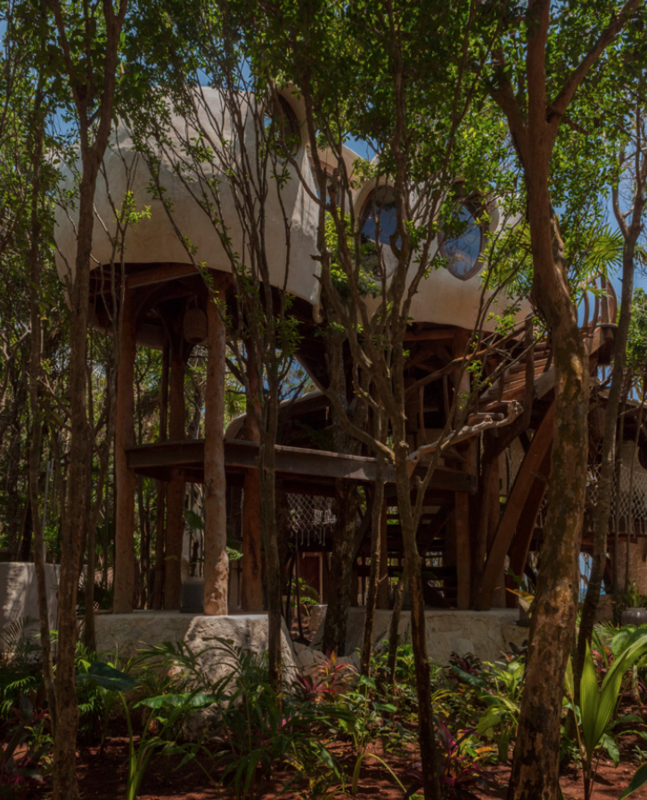 Right next to it, ecological hotel complex consisting of a dozen or so of individual cabañas, resembling luxury house-on-a-tree that Rodrigo designed and built in Papaya Playa Project in Tulum, will be constructed. It will be accompanied by vegetable and herb gardens, as ultimately it’s going to be an autonomous facility, independent from products and external media, simultaneously being a model/school of self-reliance. Buildings constructed by Larios are, similarly to an egg, of extremely durable structure whose endurance grows proportionally to forces working on them, while all the windows – despite their great area – are divided in a honeycomb fashion. With a grain of his own unique contrariness, he readily emphasizes that in case of Category 5 hurricane, he would remain sitting in his living room, eating peanuts and contemplating nature’s frenzy. Personally, I don’t doubt he has real grounds for that claim.